An impressive directorial debut from SFU alumnus Beau Han Bridge and his new theatre company Midtwenties Theatre, This is Our Youth pulls you right into the chaotic lives of three teenagers in New York City. Kenneth Lonergan (Manchester by the Sea) has created characters that are some of the most authentic I’ve seen, and his writing is extremely intelligent with subtle hints of wit that catch you off guard. 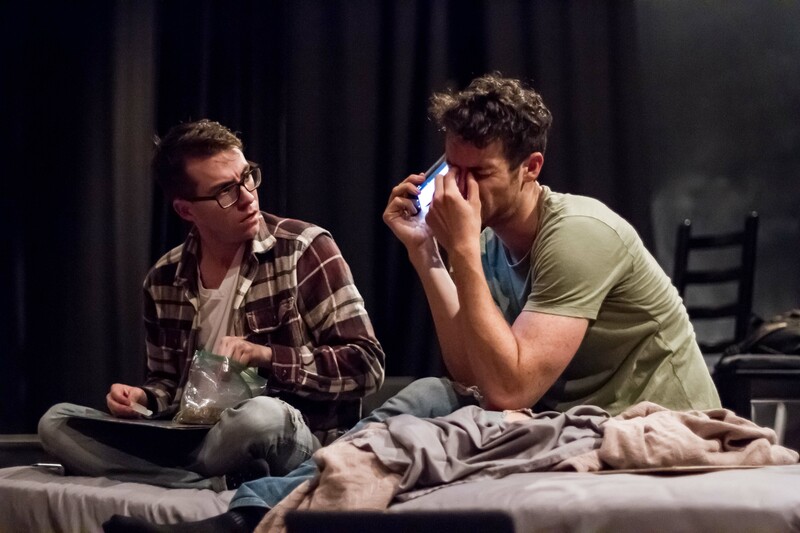 That, coupled with brilliantly genuine portrayals from Zack Currie (Dennis), Quinn Hinch (Warren), and Mackenzie Cardwell (Jessica), turns what could be mundane conversation into a richly textured commentary on youth and the human experience. Warren shows up at Dennis’s apartment in a panic: he has just stolen a briefcase full of cash from his father and doesn’t know what to do. Dennis, full of himself and half-baked ideas, schemes up a plan to buy cocaine, have a bit of fun, and then resell the rest of the drugs to pay back Warren’s dad. Warren is self-effacing, downtrodden, and emotional while Dennis is full of energy and constantly teasing Warren and putting him down. The two of them bicker back and forth for quite a while, but it never gets old as the conversation flows naturally and we get a true sense of what these characters are like. Things get even more interesting when Warren’s crush, Jessica, comes over. “Whatever you do, don’t talk about your dead sister,” advises Dennis. That doesn’t last long, and soon Warren is telling Jessica all about himself while showing her his vintage toy collection. They seem smitten with each other and match each other wit for wit discussing things such as how an individual’s personality changes over time. Warren is awkward, but in a cute way, and says things like “chivalry’s not dead, it just smells bad.” They share a beautifully tender moment when Warren puts on one of his old records and they slow dance in the apartment strewn with empty beer cans. While very little happens in terms of a plot, and we never leave Dennis’s apartment, the dialogue is so sharp and the interactions among these three characters is so vivid that an elaborate plot is unnecessary. Dennis and Warren discuss their mortality after a drug dealer acquaintance dies of an overdose, Jessica and Warren share an intimate night before having a fight over his grandad’s baseball cap, and Dennis realizes that maybe there’s more to life than sleeping until noon and doing drugs. Maybe he will go to film school instead of talking about how good he would be at making movies. For a theatre company’s debut and an artistic director’s directorial debut, this production couldn’t have been better. I was drawn into this story immediately and it held my interest as the question of what will become of these three teens lingers. I hope we see much more of this type of raw, authentic theatre from Midtwenties Theatre Society.